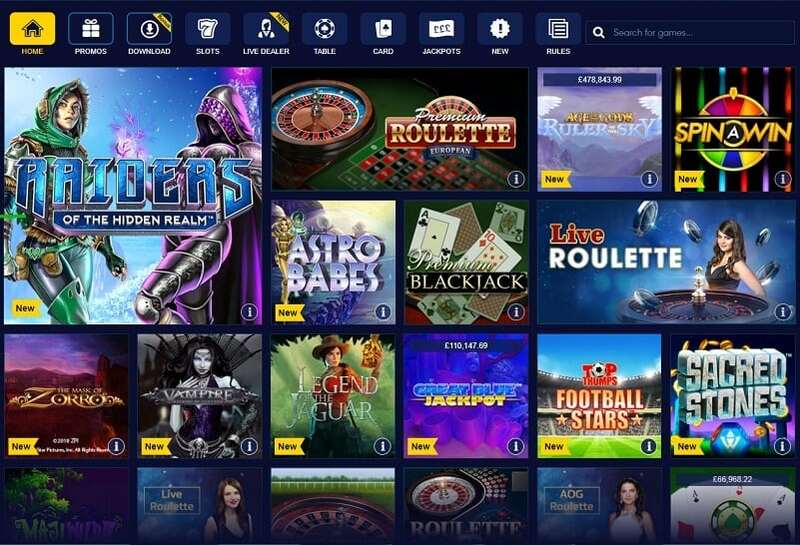 William Hill Casino £10 No Deposit Bonus! How Do I Get the Free £10 Bonus? How Do I Turn the Bonus Into Real Money? William Hill has a professional online casino containing games by the leading software house Playtech. There are hundreds of titles to check out, and you can play them for real money. But before putting your own funds on the line, you might be interested in the £10 no deposit bonus that’s granted through the use of the promo code C30. Click here and go to the William Hill Casino now! When you register your new William Hill account through the casino page and enter the promo code C30, you’ll get £10 instantly with no deposit required. The bonus carries a pretty low playthrough requirement of 35x, which is fairly easy to satisfy. Click here to get your £10 free! Then, when you’re ready to make a deposit, you’ll have a 100% up to £300 bonus to look forward to. The free money just keeps on coming at William Hill Casino. There’s no mystery involved in setting yourself up to receive £10 on the house at the Will Hill Casino. As long as you’re a resident of the United Kingdom and don’t already possess a William Hill account, you qualify. First, click on our link to go to the William Hill website. Then, press “Join” on the page to open up the registration form. You’ll have to input your accurate personal details; otherwise, you might have trouble later on when trying to cash out. 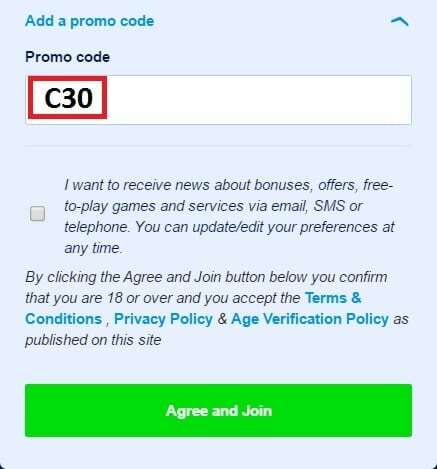 Select the drop-down labeled “Add a promo code.” Enter in the William Hill Casino promo code C30 in the space provided as illustrated below. After you’ve filled out all the fields on the screen, hit the green “Accept and Join” button at the bottom. Now your new account will be created. 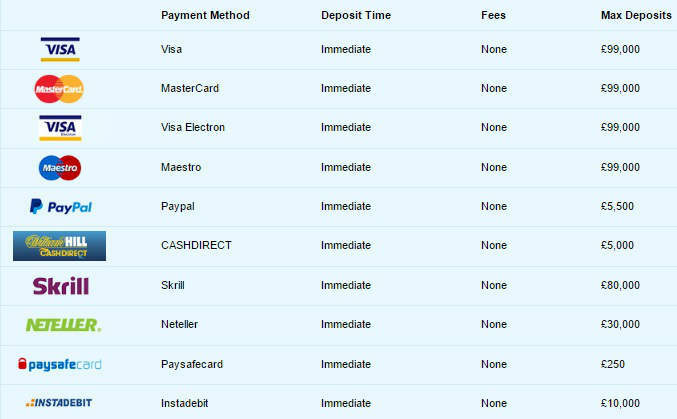 There’s just one more step you need to take to grab your registration bonus of £10. While logged into your account, head over to the promotions page for the casino section of the website. Then choose “Opt In” for the relevant bonus, and the £10 credit will be applied to your account. William Hill wishes to give you the chance to play for free, but it doesn’t court freeloaders who have no intention of actually playing. This is why there’s a playthrough requirement attached to the bonus funds. This wagering obligation is defined as 35 times the sum of the bonus, which works out to £350. Once you place wagers equaling or surpassing this £350 threshold, your bonus cash will transform into real money. After this, you can withdraw it, move it over to another product category of William Hill (i.e., poker, sports, bingo, et cetera), or keep playing with it in the casino. You only have 24 hours to complete this wagering requirement. If you let one full day elapse without achieving the required betting total, the bonus will expire along with any winnings you amassed. Be aware, though, that a varying percentage multiplier is in effect for bets placed on the different types of games in the casino. This means that, depending on your gameplay preferences, you might actually have to wager more than £350 to clear the bonus. See the Game Weightings section below for additional info about this. IMPORTANT NOTE: There’s a maximum value of £25 that can be redeemed as winnings from the C30 £10 no deposit promo code. Any excess beyond this amount will be forfeit once you finish the bonus rollover total. All newly depositing players at Will Hill are eligible to claim a 100% up to £300 bonus. Much as with the no deposit free bonus, there’s a wagering requirement attached to this deal, but this one is a bit higher at 40 x the size of the bonus. You have seven days from the time the welcome bonus is issued to complete this condition. There are actually a couple of separate platforms that you can use to conduct casino gaming at William Hill. The most widely used is probably the web version that works in almost every modern web browser, including mobile, and doesn’t require any download. The second possibility is a download version that has a few nice frills. Unfortunately, the download application is only available on Windows machines. Mac users needn’t despair, however, because the web play software runs just fine on Macs. 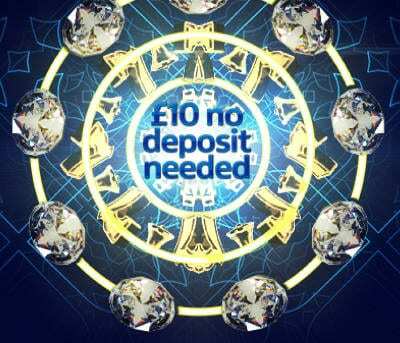 You must deposit at least £10 if you wish to take advantage of the initial deposit bonus. Hopefully, you’ll win a significant sum, and you’ll then be able to withdraw it most likely through the same method you used to make your deposit. Overall, users saw more than 96% of the amount they bet with returned back to them as winnings. This is a relatively excellent fraction, and it means that if you wager £100, the expected amount held by the house is less than £4. For the slot games, which generally tend to be big money-makers for online casinos, the return to player percentage is 95.17%. You can do even better than this by clicking on the info button for the game of your choice within the casino lobby. A small sidebar will appear on your screen showing you an overview of the game, oftentimes including its RTP percentage. Because of the decent payback percentages and the bonus earning ratio of 100%, we recommend our readers play slot machine games to clear their £10 William Hill Casino no deposit bonuses. Sign up for William Hill Casino and score £10 for free! You can read more about the William Hill Casino no deposit bonus code here!